197 travel agents from seven of the top wholesalers in Sao Paulo were present at training seminars where they received all the information needed to sell Mexico’s Pacific Treasure. The Riviera Nayarit Convention and Visitors Bureau (CVB) coordinated several training seminars at the call centers for seven of the top wholesale agencies in Sao Paulo during the month of March. The workshops were handled through the public relations agency the destination works with in Brazil. 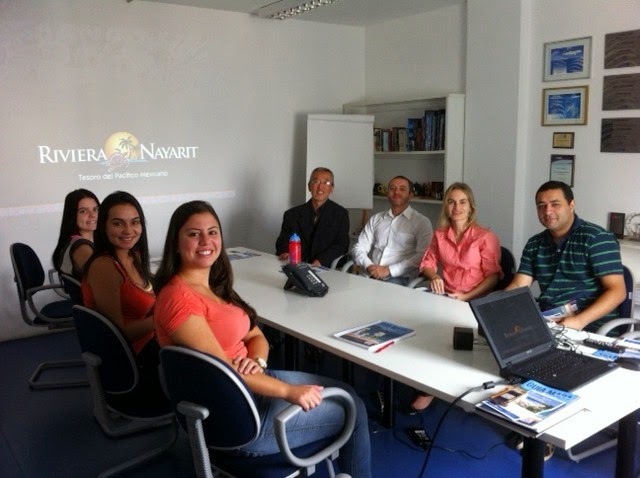 A total of 197 Brazilian travel agents were trained. The final report indicated the agents were especially interested in Nuevo Vallarta and Punta Mita thanks to their important hotel infrastructure, since the Brazilian tourists really enjoy luxury accommodations. Among the many important areas covered during the workshops for the agents the team highlighted the clean beaches, informing them about the possibilities for tourists to be able to enjoy calm beaches and plenty of places to lay their towels along the more than 300 kilometers of beach in the Riviera as opposed to crowded venues. The fact that it’s a destination for couples, married couples with children, seniors and weddings was of interest to those present, as there aren’t many destinations in Brazil that offer as many options, not to mention the tranquility, exclusivity, haute cuisine and safety found in the Riviera Nayarit. This initial phase included working with the agents that are part of the wholesalers that promote and sell the Riviera Nayarit; the second phase will take place with retail agents. Each workshop lasted approximately two hours, during which, among other things, a video was presented so they could visualize the destination’s golf, water sports and the grand events that take place throughout the year in the Riviera Nayarit. This promotional and sales effort complements the public relations and marketing work that’s currently taking place, continuing to position the Riviera Nayarit within the potential market of Brazil.